Just wanted to post about a great software that I am using to print from excel using vba to a pdf file. Adobe Acrobat was too messy, and cost a bomb. However PDF Creator is an open source project developed in vb which is quite cool. It is still a bit buggy, but is great work. If anyone is looking to contribute, look up the site of the developers. This error may be common in other situations too but I had to spend an hour getting to solve it and wanted to put it up for someone else who needs it. 3. Sets up the code so clicking the button opens the pdf file. OLEFileString = PDFPath & "sheet" & Trim(Str(i)) & ".pdf"
Just to clean up the interface, I added the pdf files on a separate sheet. So this code wasn’t working. From a few forums, I tried to add a wait through Application.Wait (Now + TimeValue("0:00:02")) but it didn’t solve the error. Finally it seems to have something to do with the inner workings which is not documented or buggy or both. Apparently after adding the code to the module, the object interface is closed for the worksheet. Simply adding the code generation to a separate loop fixed the problem. It now works perfectly! If you have any suggestions or questions, please comment. If you are setting up a blogger custom domain and get the 404 Server Not found Error, just set the blog back to a blogspot address, save it and then set it back to your custom domain again. Of course, your domain’s cname records for the blog custom domain should be pointing to ghs.google.com first. 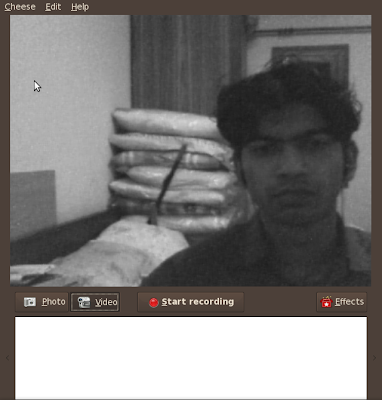 I have a logitech quick cam express web cam and a cheap microphone I picked up at nehru place. I installed skype from the repos and neither the audio nor the video would work. Chats worked fine though. So began trying to get them to work. I decided I would get the latest deb version from the skype website and work with that. You can get the deb package or other packages from here. During install I am warned that it is better to keep the older version from the repository itself, but I go ahead and install the new version. I still have no luck and the test video in video options of skype shows a green noise, with no audio input. First the Audio. Make sure that your alsa mixer settings are proper. You could try recording with the sound recorder or audacity to ensure that your microphone is plugged in right. 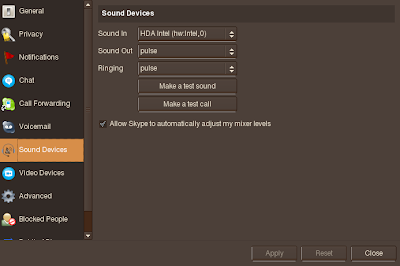 Then in the Audio options in Skype set the Audio input device (Sound in) to the hardware device. For me it is HDA Intel (hw:Intel,0). Sound Out and Ringing should be set to pulse audio. Go ahead and do a test call from the main skype window. You should now have audio. If not, try changing the sound input to various values, applying and then testing. This seems to a common problem with Skype on Intrepid Ibex. I got the workaround from a thread on Ubuntu Forums. We begin based on a tutorial by Howard Shane. In my system, it shows the camera on the second line. Your camera should be detected too. Once you are sure that your camera is up and running, you can install cheese to see if the cam works. Start the Video playback and ensure that your camera is online. Ok, now we only have to configure skype to startup differently. Then make the file executable. Skype now works fine with video too. To test, open skype options and select the video section. Select the appropriate camera (there usually should be only one) and click the ‘test video’ button on the top right. If everything is ok, then the button will be replaced by the video.